Protein is an essential macronutrient that should make up between 10 and 35 percent of daily calories, according to the Institute of Medicine. Animal products, such as meat, fish, poultry, eggs and dairy, are some of the most common and effective sources of protein, but grains and vegetables also contain some protein as well. Although it offers minimal nutritional benefit, white rice does offer a little protein per serving. Proteins consist of chains of amino acids. While your body can produce some of these amino acids on its own, you must obtain nine of these from your diet. Foods that contain these essential amino acids in adequate amounts and ratios are called complete proteins and include meat, fish, eggs and dairy. Foods lacking one or more of these essential amino acids are known as incomplete proteins. White rice is one of these incomplete sources. A cup of long-grain, medium-grain or short-grain white rice provides 4 g of protein per cooked cup. Choosing instant or pre-cooked rice does not affect the protein content. 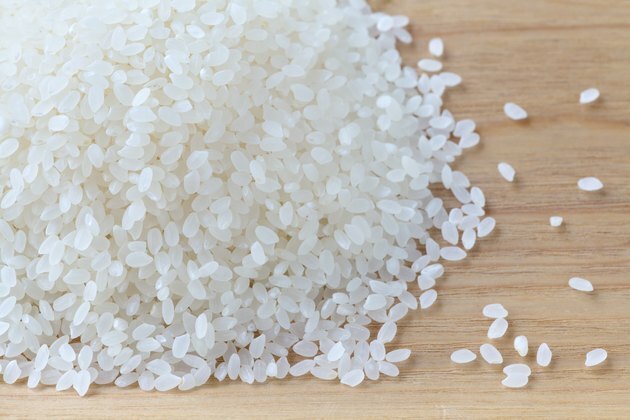 White rice lacks adequate amounts of the essential amino acid lysine to form a complete protein. A diet that includes a variety of incomplete proteins daily can give you all the proteins you need. Eating beans or peanuts on the same day that you eat white rice helps you form a complete protein. While it was once advocated that you eat complementary proteins at the same sitting to benefit from the creation of a complete protein, the Centers for Disease Control and Prevention notes that your body can form complete proteins when you consume complementary proteins on the same day. When it comes to grains, white rice is not your optimal choice. Quinoa is a grain that offers 8 g of complete protein per cooked cup and may substitute for white rice in many recipes. Although brown rice contains only 1 g more of incomplete protein per cooked cup, it is a richer source of fiber to help with satiation and healthy digestion. Millet is another grain that can be used like white rice, but it offers 6 g of protein per cooked cup. Although the protein in millet is incomplete, it provides more trace minerals and is less refined than white rice.